I thought this was a funny and somewhat coincidental juxtaposition of subjects. 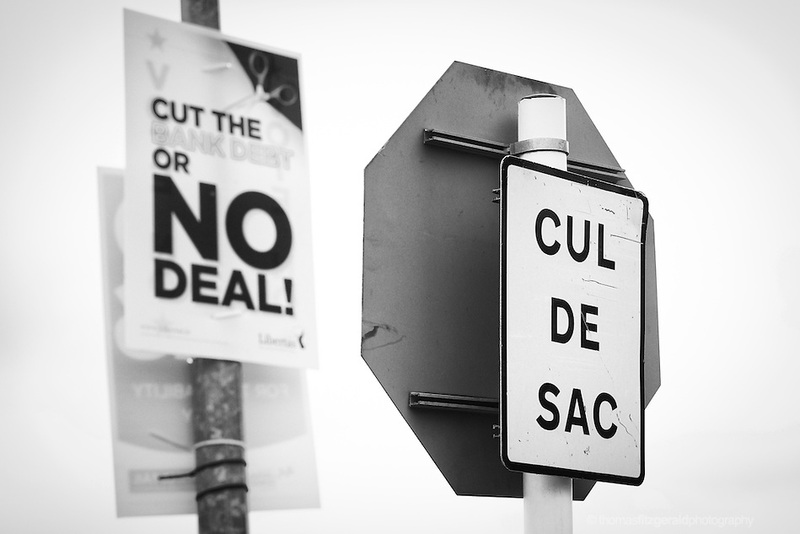 The "Cul De Sac" sign for a dead end against an election poster for the upcoming fiscal treaty referendum here in Ireland. For those not familiar with elections and referenda here in Ireland, every time the public gets to vote every street light, and upstanding pole or other suitable vertical mounting point gets covered in the infamous "Election Poster". They're all pretty much the same size and all with the same bite sized anecdote that is supposed to sway your vote. While I'm sure that there's an argument that it's democracy at work, they're a bit of an eyesore. Anyway, I was out for a walk with my camera so I thought I'd have a bit of fun with it. I've started gathering some more photos of them into a gallery and they're available for licence for editorial purposes.